Explore the videos of the Web Presence Group. Our video library is composed of videos that are insightful, educational, and reflect the best practices of SEO and website optimization. We strive to share our knowledge and expertise, and we offer our visitors a wealth of information via the interactive media below. Learn what makes our website optimization company unique from other providers of SEO and website optimization. To view the page of this video, click here. Learn how to conduct a website analysis for keyword research, as well as insights on how to use the Google Keyword Tool. This part one of the keyword research phase. See the video below for part two. In this video we dive deeper into the keyword research process by analyzing the search engine results page (SERP) of our keywords. This is to get a good understanding of how competitive keywords might be and whether or not they are good SEO targets. 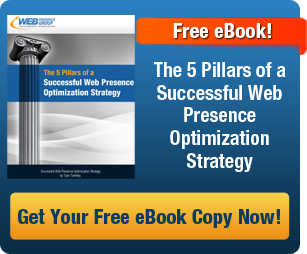 This video showcases the 5 essential elements of website optimization. This entails the HTML sitemap, having a cohesive navigation with optimized internal linking, keyword optimized pages, call to action (CTA), and the impact of social media on search.